Guerrilla Games' Horizon: Zero Dawn just celebrated its first birthday—as well as passing 7.6 million in sales. 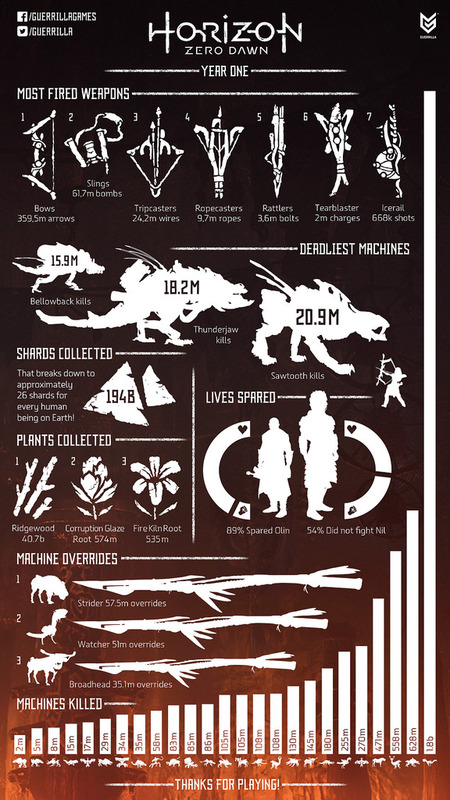 Now, PlayStation is looking back on year one of the game with an awesome infographic. While Horizon is a singleplayer experience throughout, the game does track certain metrics, and Guerrilla has revealed a number of them on the PlayStation Blog. The image is full of interesting information, such as how many different kinds of weapons were used, and how much ammunition was fired. In total, players fired 359.5 million arrows with a bow, Aloy's signature weapon. There's a ton of dangerous machines in the open world of Horizon, but none more dangerous than the Sawtooth, which amounted to 20.9 million player deaths. Close in second was the ferocious Thunderjaw at 18.2 million kills. Aloy is just as lethal, though, as players racked up an insane amount of kills on every machine in the game. None died more than those poor little Watchers, who were mercilessly slaughtered a devastating 1.8 billion times. Cheers to Guerrilla and PlayStation for one year of Horizon. With the game's massive success, you can be sure there will be more of this franchise to be seen in the future.